← The snob factor: Pitfalls for Europeans in the U.S.
Four years after Palin: Will Virginia love Ryan? Back on the campaign trail this past weekend. And Manassas in 2012 felt a lot like Fairfax in 2008. A long line of people stretched around several blocks in the historic downtown to see Paul Ryan, Mitt Romney’s VP pick. Four years ago cars were lined up bumper to bumper as far as a mile from the park where John McCain presented the populist Sarah Palin as his running mate. Back then, my first instinct was: This is never going to work. But when I saw the crowds in Fairfax, I had second thoughts. Was she the Alaskan Wonder Woman who would help McCain win the election? Today we know how that choice played out, so there is reason to be cautious. Ryan is polarizing in a different way. He does not turn the campaign into a soap opera as Palin did, but he represents the pure doctrine of fiscal conservatism. For this reason, he seems to attract a somewhat different crowd. At the Palin event, it was hard to miss the large number of rednecks sporting sunburns, tattoos and patriotic gear. Another distinct group was female admirers who saw Palin as a role model for conservative women. At the Ryan event, the rednecks shared the Harris Pavilion with Northern Virginia’s landed gentry: The men mirroring the accurate smart-casual looks of the Romney-Ryan duo, the women wearing pearl necklaces over blue Mitt Romney shirts. It is safe to say that in nearly five years of watching Romney run for President I have never seen such an energized crowd. 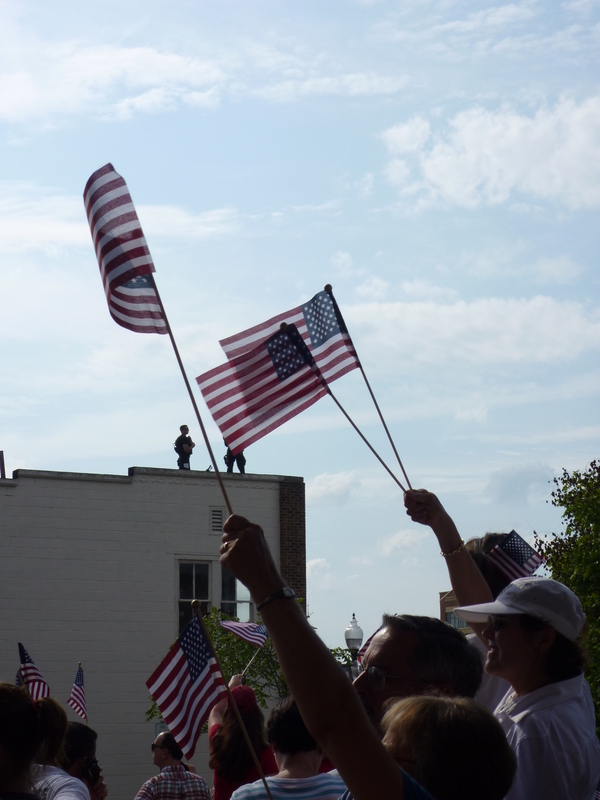 The flag-waving, the devout murmuring during the prayer session, the stomping to the rock songs announcing the arrival of the candidates, the chants of “Mitt, Mitt, Mitt” and “USA! USA!” – it was there before, but never quite as frantic. Enhanced by speakers that carried the sounds across town, the Romney-Ryan Fest must have seemed intimidating to the Obama volunteers who set up shop that day in a building on Main Street. Compared to Romney’s rock concert, the Democratic gathering looked like an after-school jam session. Obama supporters came and went, chatting and munching cookies. 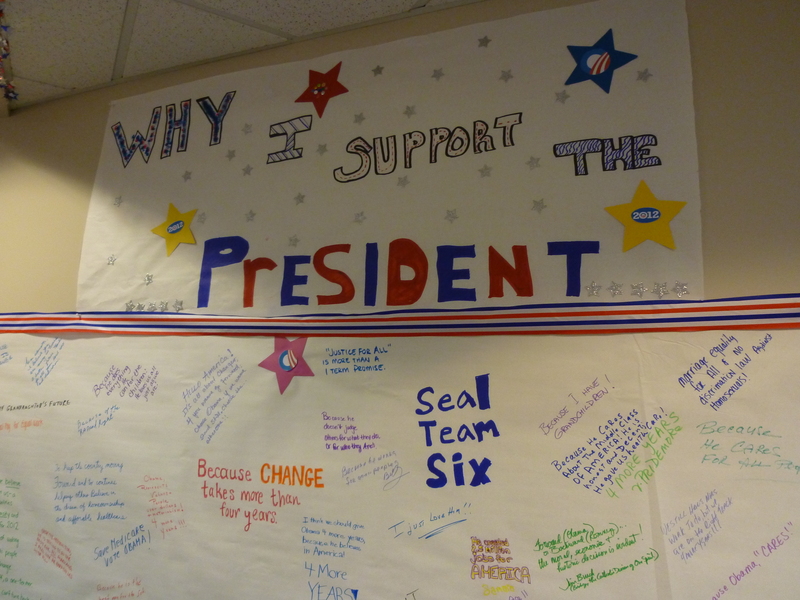 The back wall was covered with white paper on which the visitors could write down why they support the President. “Because four years are not enough,” read one posting. “Seal Team Six”, said another one in reference to the Special Forces who killed Osama bin Laden. The leader of an independent church that sees itself in the Catholic tradition held up his own hand-made sign: “The Romney-Ryan budget is immoral”. Ryan won’t flop like Palin, but whether he adds momentum to Romney’s ticket or drags it down will depend on how Americans judge the substance of his plans. This entry was posted in Americana and tagged Mitt Romney, Paul Ryan, Romney Ryan 2012, Ryan in Manassas, Sarah Palin. Bookmark the permalink. 1 Response to Four years after Palin: Will Virginia love Ryan?